What’s the best way of introducing a young audience to the thrill of Shakespeare? Our answer is not to study one play or one scene but to engage with ALL the plays and allow people who have never explored the plays of Shakespeare to experience all of them visually using their natural curiosity. How many plays did Shakespeare write? Which feature ghosts? Which are non-fiction and which are made up? Using the new What on Earth? Wallbook of Shakespeare, published in collaboration with The Shakespeare Birthplace Trust, this talk explores the world of human emotion using different coloured pockets in an all-new coat to represent jealousy (green), anger (red), riches (gold), love (purple), terror (white) and magic (black). 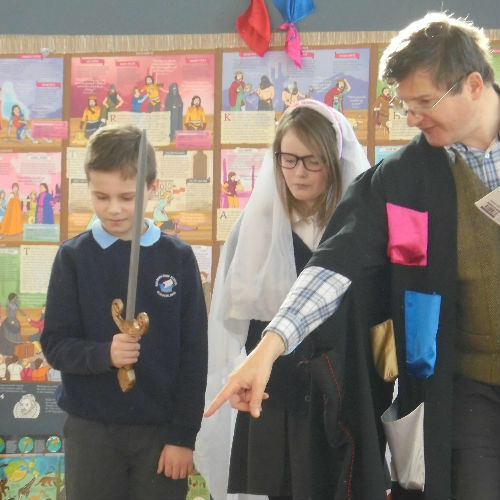 Using a series of props hidden inside the pockets, pupils explore the world of Shakespeare as a gateway to the entire spectrum of human nature.